YOU ARE A HUGE PART OF IZ’s SUCCESS. SIGN UP NOW. Now become part of his story. His ‘ohana (family) around the world has grown in to a tight-knit, knowing community of music lovers. Get to know this community better by hearing their story and comparing it to yours.Tell us how you discovered IZ, did you see him in concert, what’s your favorite song, how often you listen to IZ, has his music helped you through a rough patch?…it’s all part of the story.Send us your IZ stories, photos, artwork, videos, etc. and we will add your submissions to our Fan Map! Together in IZ World. Just fill out the form to your left! If you have any questions or trouble with the form, please comment or email us. 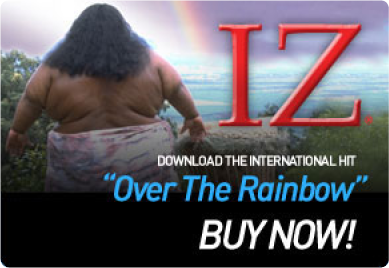 Submissions are not automatically added, and someone from IZhawaii.com will add your entry shortly. Mahalo in advance for your patience. Submission Agreement: By submitting your materials for inclusion in the Together in IZ World promotion, you are granting permission to Mountain Apple Company Big Boy Records to use those materials for promotional purposes and are warranting that you have the right to grant this permission.